Fully aquatic hermit crabs, which are all marine, need a saltwater tank as carefully regulated as that for any other sea creature. While land hermit crabs are not the low maintenance pets some unscrupulous suppliers may claim, marine hermit crabs have more specific needs. However, if you are prepared to invest the time, money and effort, these crabs do make delightful pets. Determine the most suitable species for your tank, based on the conditions of that tank and the creatures you already own. 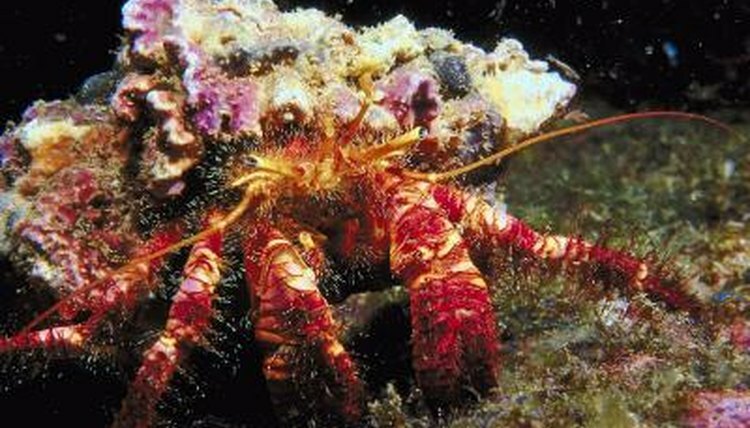 There are a large number of marine hermit crab species. They not only have different needs with regards to temperature and water parameters, they also exhibit very different behavior. Some marine hermit crabs are voracious carnivores, liable to eat any other aquarium animal smaller than they are, others will graze their way through corals and some are peaceful scavengers. Make sure the conditions are suitable and choose a species that won’t eat your other pets. Feed the hermit crabs -- it is best to have more than one as they tend to be social creatures -- an appropriate supplemental food. In the case of many species, this will be a fish food for omnivores. Drop a few pellets or pieces of the food into the tank and let them sink to the bottom. Pick up any uneaten food after an hour, so that it does not rot and pollute the tank. How much and how often to feed depends on the species, the size of the crab and how much food he can find in the tank by himself. If you are not sure, judge his needs by the amount he takes each time. Sterilize a selection of empty shells, all slightly larger than the shell the hermit crab is currently wearing, by boiling them in distilled water in a glass or ceramic pan for about 20 minutes. Allow them to cool and place in the tank. Hermit crabs need to move house as they grow and prefer to have several different shells to choose from. Ensure that at least some of the shells have apertures of roughly the same shape as that of the shell the crab is currently wearing, for example round or oval. ⚠ Marine hermit crabs, as with nearly all the creatures that need a saltwater tank, are not a particular “easy” pet. They are not a suitable pet for children unless an adult takes full responsibility for their care, and people new to aquariums might be better off starting with freshwater creatures.